Was It Round Up or Down? We don’t need no stinkin’ plans. Definitely. Someone zigged right when they should have zigged left. Uh Oh. Just a little bit off…. You’ve got that right. 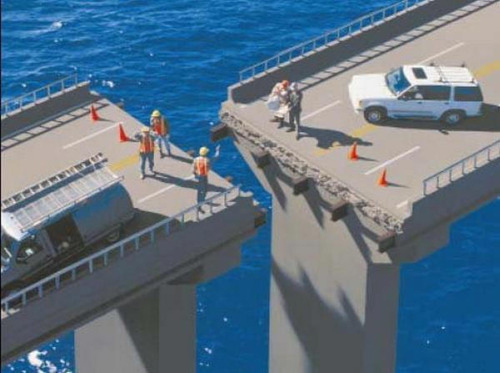 Looks like that bridge will take a little longer to complete than expected. I don’t want to be on the receiving end of that oops. One of my nightmares is driving off of a tall bridge. I won’t be drive on any high bridges anytime soon. I think that one was pretty expensive for someone.